How would you like a kitchen helper that’s fast, powerful and economical? Why not invite the Tru Eco induction cooker right in. This compact cooktop from Select Brands works by inducing, or transferring, heat through magnetic fields (you'll need an induction-compatible metal pan or pot to sustain the magnetic field). It can go from 125 degrees to 425 degrees in an instant, and it cools down just as quickly. Plus it’s incredibly energy-efficient compared to traditional gas burners and electric ranges, which can experience heat energy loss approaching 50%. This little powerhouse packs a serious punch. Having an extra burner around holiday time is a real bonus. If space is limited in your apartment or condo, the Tru Eco takes up precious little room. Tailgating? Camping? Set up is a snap, and the ceramic finish cleans up in a jiffy. It’s a great gift for the person who has everything. Save time, money and energy while you give your kitchen an easy upgrade that won't put a dent in your wallet or the environment. 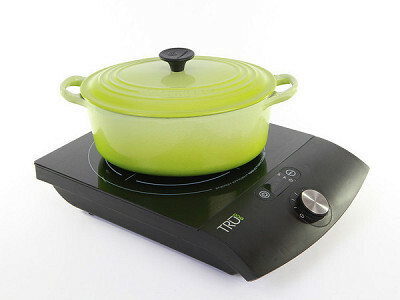 My name is Eric and I'm with you today to discuss the TRU Induction Cooker. same efficient, safe and precise cooking style to your own kitchen. This is one of those products that once you have you'll figure out many ways to use it! Great idea, especially with the holidays coming up! This looks like a really nice product if you want to save energy. @Charlie: There is definitely efficiency in induction cooking. Induction is 90% efficient. As a comparison, a gas range is 55% efficient and an electric range is 45% efficient. I shared this with my friend Anne. We always do Thanksgiving at her house and burner space is at such a premium. I really didn't realize you could do serious cooking on an induction burner. I really like the idea of cooking outside or at the table too...crepes and stuff to go along with a barbeque. Could I do slow cooking(low heat) safely with this burner? these settings, but it would probably not be considered a true slow cook. cooking time on this induction cooker is 3 hours (plus 2 hours in stand-by). is this powered by battery? (I don't see an electrical cord). If there is an electrical cord, does it have a 3 prong plug? @dawn: It has an electrical cord with a 3-prong plug. What is the diameter of the cooking surface and what is the overall size of the unit? @Susan Gawarecki: The product itself is 11.2” wide x 14.4” deep x 2.5” high. The glass ceramic plate itself is an 11” square. Thanks for stopping by. 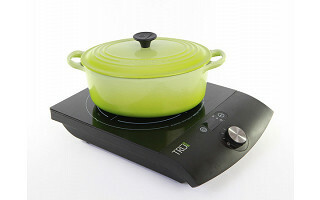 How durable is the TRU Eco Induction Cooker? I'm considering making it my primary cooker. Could it withstand everyday use & bear heavy cast iron, including a 6.5 enamel cast iron dutch oven? @K: I have forwarded your question on to Eric to get his advice for you. Thanks for stopping by! hold a cast iron vessel, although a 6.5 quart may be larger than suggested. Is it recommendable to leave the cooktop plugged in when it is not being used? Does it use up energy when plugged in but not in use? 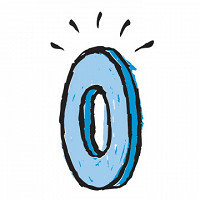 @Curious: The majority of appliances when turned off use zero electricity. If the induction cooktop is plugged in, but there is no pan on top, no lights on and no fan operating, it is not drawing any current and not using any power. How would you like a kitchen helper that’s fast, powerful and economical? Why not invite the Tru Eco induction cooker right in. This compact cooktop from Select Brands works by inducing, or transferring, heat through magnetic fields (you'll need an induction-compatible metal pan or pot to sustain the magnetic field). It can go from 125 degrees to 425 degrees in an instant, and it cools down just as quickly. Plus it’s incredibly energy-efficient compared to traditional gas burners and electric ranges, which can experience heat energy loss approaching 50%. This little powerhouse packs a serious punch.